Here we are! I managed to get my chair finished and before our display among ourselves even, although it then took me a week and a half to get the post up and ready. 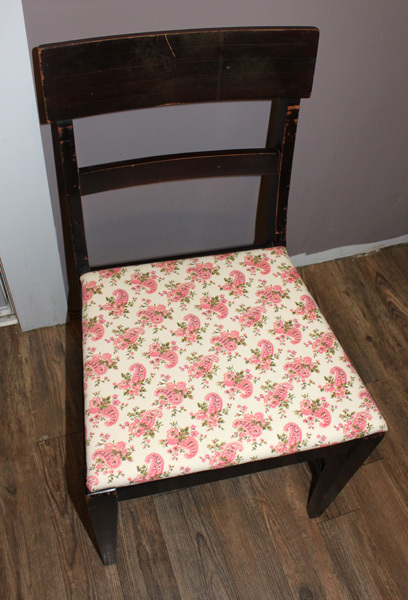 The chair I chose to makeover is one of my kitchen chairs. Years ago, I received this wonderful 50’s table and chairs set from Memom (Mom to two Craftysisters and Grandmother to the other two). I loved the set, but the upholstery on the chairs was getting old and there were a few tears here and there. 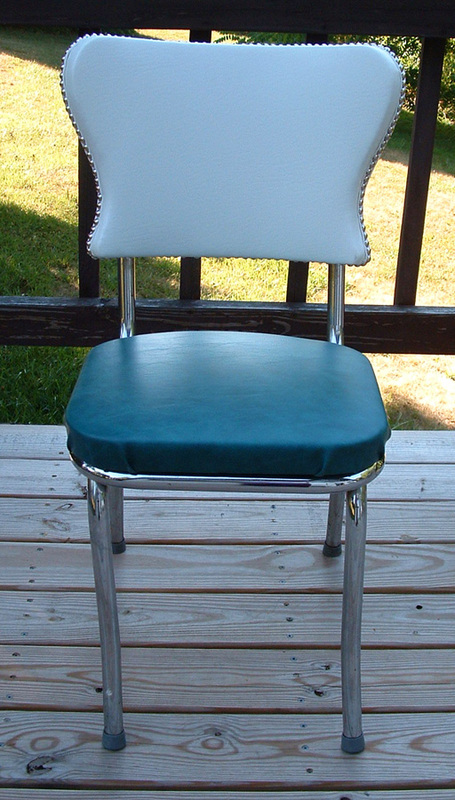 I decided that I would reupholster them, attempting to keep the same general style of vinyl, but more modern and more to my color scheme. Here you can see the old and cruddy furniture tacks that I replaced. I have actually already re-upholstered four of the six chairs and had started on a fifth when I made a common (well, common for me) error in judgement. I tried to used a piece of vinyl that was just a little too small. I was running out of material and didn’t want to buy some more (this even though I would need to buy more to finish the last chair). I have a tendency to make this sort of decision when I am too tired and should really just put the project away for a while. Well, maybe I learned my lesson this time. Anyway, I had already taken the chair back off and it was mostly finished, when the problems with the too small piece of vinyl really became apparent. There was no way to hide the staples holding the vinyl in place as the staples could not be placed in their proper positions due to the smaller size of the vinyl. At this point, my frustration in having to take all those darn staples out yet again caused me to set the whole project aside for about a year and a half. 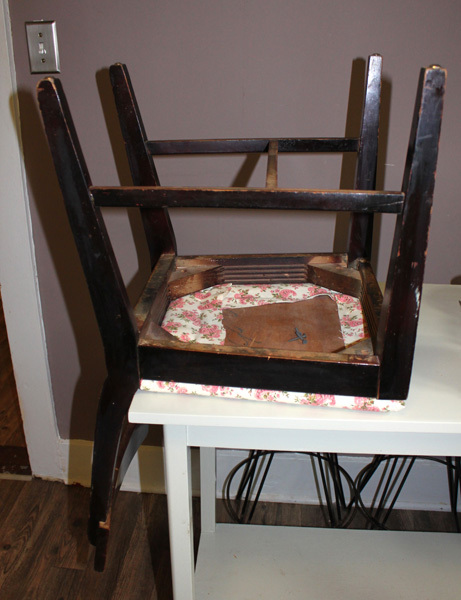 Of course, all this time the chair has sat upstairs in my loft as an impalement accident waiting to happen as the chair back was never put back on. So, along comes this excellent opportunity to get back in the swing of chair re-upholstery and finally get at least another chair finished. I found the color of vinyl that I wanted for the seats at Great Lakes Fabrics and bought quite a bit of it as I wanted extra for possible repairs later. The material is marine vinyl and I will eventually replace the backs with material from there as it is extremely durable. I wanted a marbleized effect that was reminiscent of the original fabric and this was similar and yet was much more my color style. I also purchased a large quantity of chrome half-dome furniture tacks from the same place. The white vinyl for the chair backs I purchased at Joann’s. I used high loft quilt batting from Joann’s for padding in my chair backs and a double layer of this for the chair seats. Taking the chairs apart proved to be a great exercise is damaging fingers. I learned very quickly the importance of a good tack puller, pliers and wire cutters. 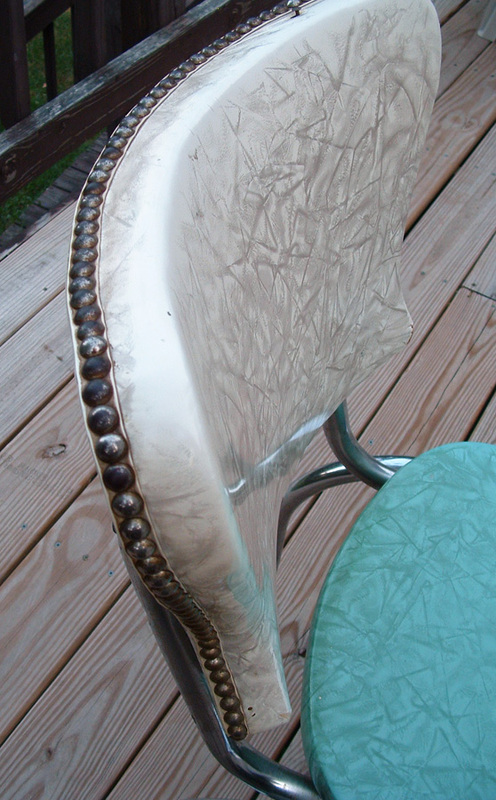 There are over a hundred chrome half-dome furniture tacks on the back of each chair and that plus more than a hundred staples, makes taking the chairs apart a real chore. This is the step I really learned to dread more and more with each chair. I absolutely love the finished product though, so it is well worth it in the long run. As this is my fifth chair to finish in the set, I can say that I have really learned a lot about re-upholstering kitchen chairs. 1. Always have excess material. You can cut off excess, you cannot add on more material after it has already been cut. 2. Wire cutters work very well to remove tacks and staples. The sharp edge grabs onto the tack or staple and pulls them out very handily. 3. Sub-staples, Sub-staples, Sub-staples. I got this from Craftysister Loryn who got it from Design Sponge. These are temporary staples put in at an angle and are meant to be removed. Design Sponge has a series of wonderful upholstery posts that describe everything you would really ever need to know about re-upholstery. 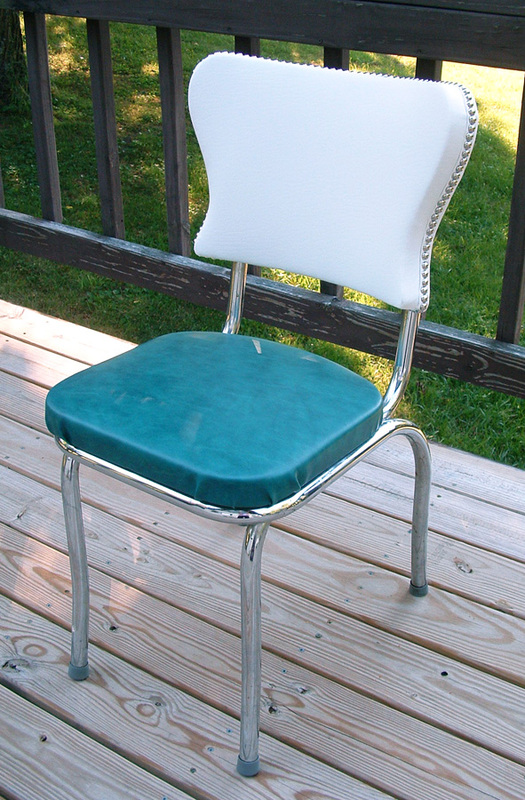 I really wish I had seen these tutorials before I got started on my kitchen chairs. This pretty much guarantees that I will be re-doing the first four chairs again. I am very, very happy with how my chair turned out and may actually get to the last chair in the set this week sometime. I am off all this week so, other than the heat, I have no excuse for not getting the last chair finished (other than the realization that I need to re-do the first four chair backs again anyway.). I just love how sub-staples make the finishing on the chair backs so easy! When I look at this chair compared to the first four, I just cringe. Loryn: You can make simple pillows from just a bit of fabric and some stuffing material. For this pillow, I did a simple slip stitch closure that is quick and easy. If you’re not confident with slipstitching yet, read on for some tips to help upgrade your skills. For simple pillows, you can be really creative with materials. 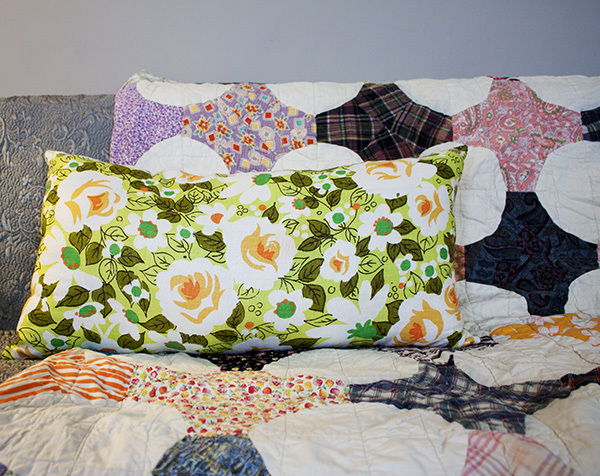 For this pillow I used vintage linen tea towels, an inexpensive source for a great print. I used two bed pillows for stuffing material. This pillow is very tightly stuffed to provide a lot of support. 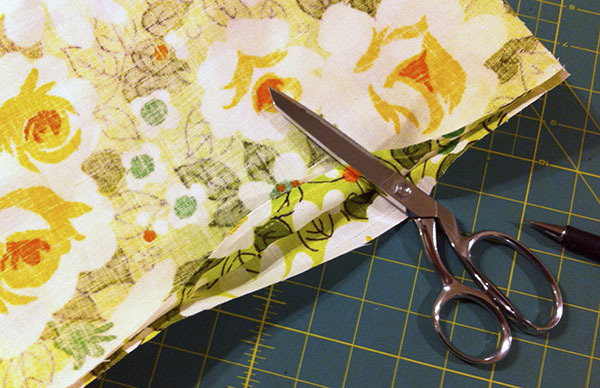 To make your pillow, cut two pieces of fabric to size, and pin them together with the right sides together. Sew the edges together, leaving an opening for stuffing the pillow. Be sure to leave the opening in the middle of a seam, not in the corner, because it’s hard to form a corner with hand stitching. Trim the corners so it will be easier to turn them. Turn the envelope right side out, and press the seams. 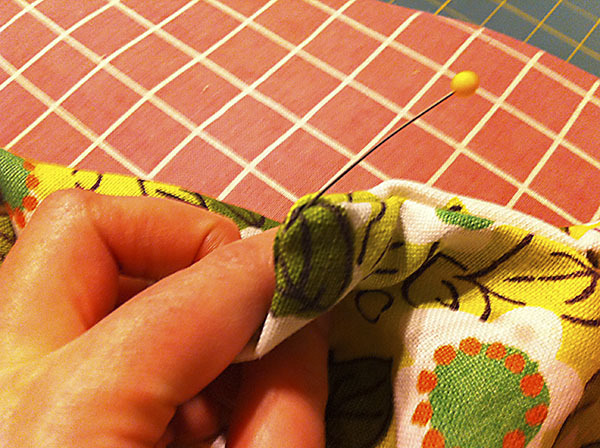 Use a pin or dull needle to pull the corners out, but don’t pull so much that you tear the seam. 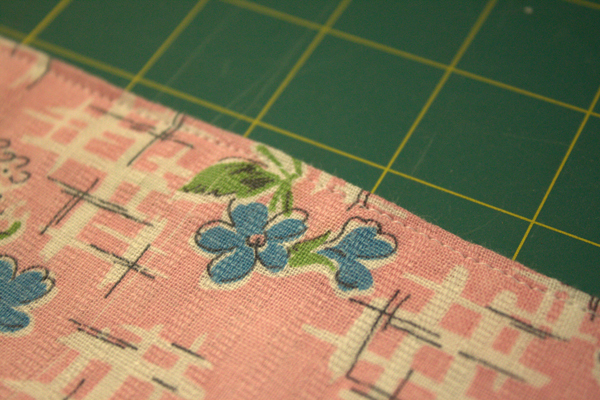 Before you start stitching, pin the seams in place across the opening. You’ll place your slip stitches right on the fold. 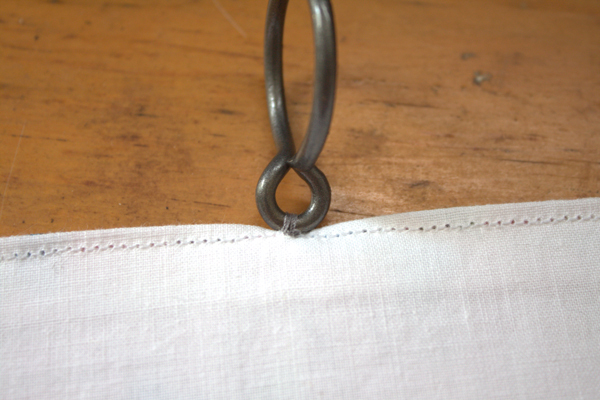 Place your knot inside the seam, and bring the needle out on the fold. 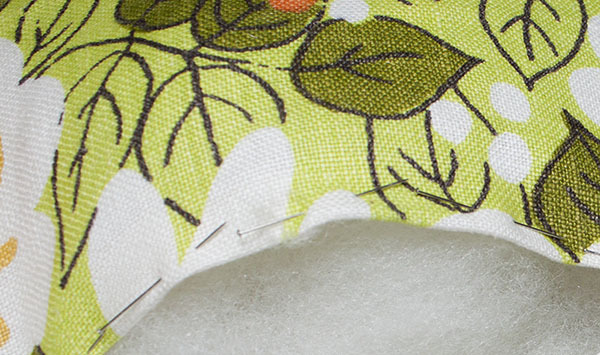 The most important thing to do to make your slip stitching look good is to keep your stitches lined up. Make the stitches short, and catch the fabric on the other side directly opposite your first stitch. Pull the stitches taut after every few stitches. Keep sewing all the way across the opening. 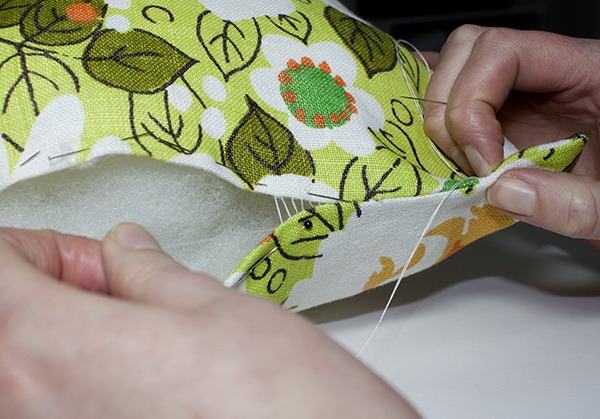 When finished, make a knot with your needle, and hide the thread inside the seam. Enjoy your new pillow! Loryn: Now that my hallway repairs are complete, I get to do the most fun (and sometimes hardest) part—choosing colors. The four swatches above are colors that I tried. 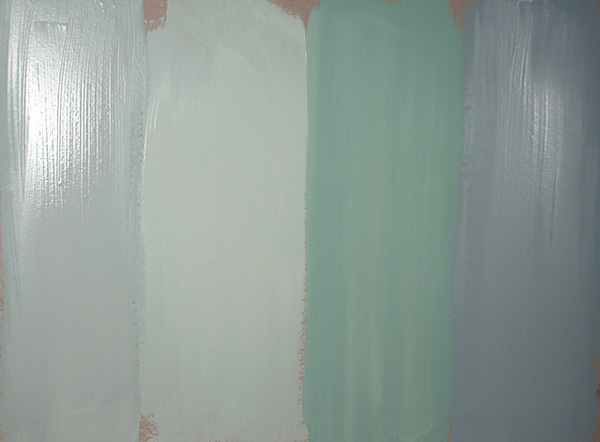 The first is a gorgeous pale blue that looks wonderful in the can and not so wonderful on the wall. One of the hardest parts of choosing colors is that the location and light source makes such a big impact on the color. That color would probably look great in a light-filled room, but not so good in a dim hallway. 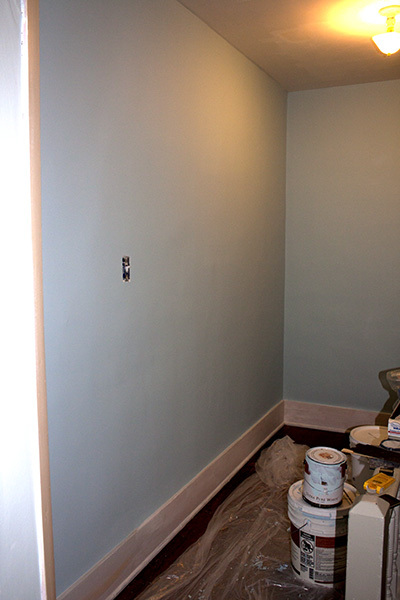 The second color is a very pale green that simply looked like dirty white on the hallway wall. The third color is a darker version of the same color. Again, it’s a beautiful color that looks too bright and overwhelming in a space that isn’t well light. It looks more gray than blue in this picture. I’ll take more pictures when I have the new lights in place, all the transoms open, and lots of paintings, photos, and prints on the walls! 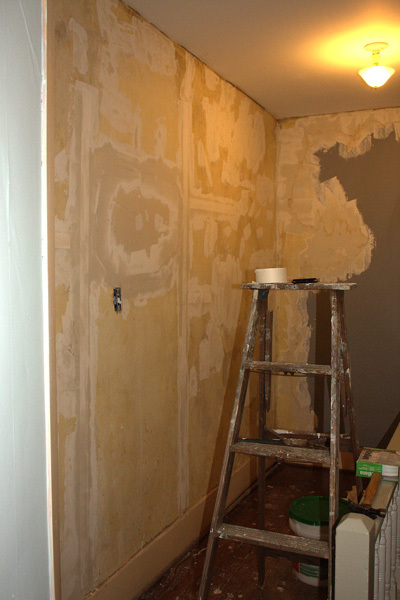 Loryn: For the past few weeks, I’ve been working on fixing the plaster in my upstairs hallway. You can see more about the project in my previous post. In the past three years, since I started remodeling my house, I’ve gone from a complete beginner at finishing drywall and skimcoating old plaster walls to being pretty proficient. I’ve been w I made a lot of mistakes, and here are a few to avoid! To place paper tape: The trick to applying paper tape without any bubbling is to lay a fairly thick bed of mud under the tape. Then, place the tape and run your knife along it, pressing the tape very firmly into the mud. You’ll remove most of the mud when you do this. Keep your knife at a very sharp angle most of the time when you’re working. When putting topcoats on your seams, it’s much better to use too little mud than too much. You can always put more on, but it’s a pain in the neck to sand away too much. After your first top coat, put on just enough to fill in the dips and voids of the first coat. To get a smooth finish, pull very firmly on the surface, with your knife at the sharp angle. Don’t keep working and working the mud, you’ll just make it even worse and increase the chance that you’ll get some debris in it. It’s better to fill in on the next coat than to botch a passable coat. If you have a wide area that you can’t get smooth, leave narrow ridges, like that pictured above, between knife passes. These are really easy to knock down when dry—just run your knife over them. Expect the process to take more than two topping coats while you’re learning. Continue to fill in small dips until you have the surface fairly flat, and don’t worry about the number of coats you’re putting on. This isn’t the type of job you’ll finish in one day. Instead, work a little bit over several days. If you have any chance to watch pros at work, take it. I learned more from watching a pro for twenty minutes than I did from many hours of website searching. If you know one who will demonstrate technique for you, all the better! Use specialty cornerbead to help you get good corners. Bead for outside corners is an absolute must for beginners, as it will make your corners look perfect. If you are doing cathedral ceiling, buy special tape for odd angles. I use Strait-Flex tape. It’s pricey, but worth it, as even experienced finishers can have trouble with odd-angled corners. It’s also great for 90 degree inside corners with wide gaps (great if you, like me, are not very good at drywall hanging). Finally, the very best way for a beginner to get good results is to use flat paint. Really! 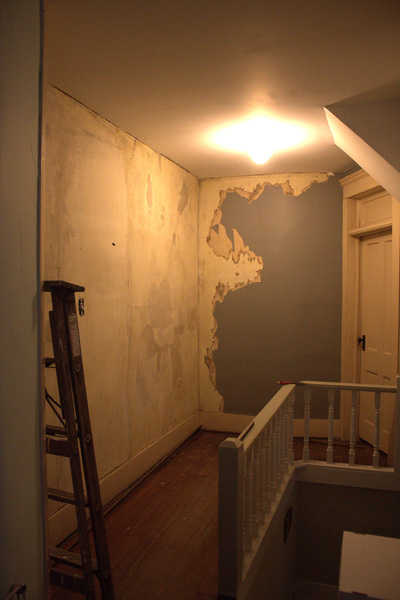 In old houses, with unsquare corners, rough plasterwork, and layers of wallpaper, flat paint is a necessity. It absorbs light instead of bouncing off every dip and flaw. It is not washable like satin or semi-gloss (though it is more washable than people think), but it more than makes it for that in touch-up-ability. You can touch up small areas of flat paint without leaving any sign of the touch up. Just use a mini roller, and you’re done in no time flat. Loryn: One of the downsides of owning a 100+ year old house is the 100 years of wallpaper layered on every surface. When I first bought the house, I had grand ideas of removing all of it and skimcoating. These delusions ended after it took a few months to strip four rooms—rooms covered in up to fifteen layers of wallpaper, wallpaper that came off inch by frustrating inch. The house has fifteen rooms total, many of them large Victorian rooms with ten foot ceilings, and even my helpful, crafty family just doesn’t have that much enthusiasm! Since then, I’ve started painting over the already painted wallpaper as a compromise to make the house actually livable. There are a few places, though, where the wallpaper is already peeling and has to come off. 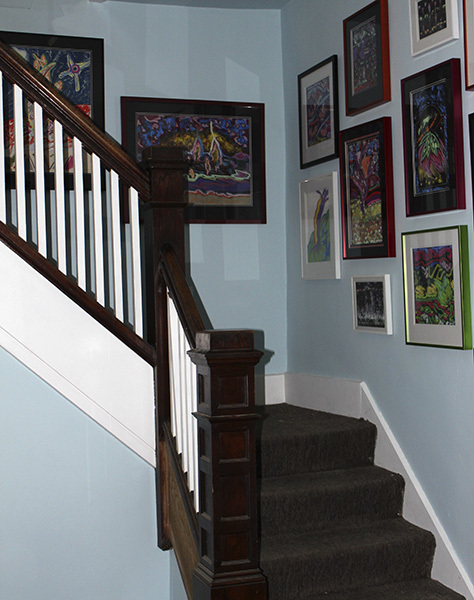 The end of my upstairs hallway is one of those places. Above, you can see it in progress. I don’t have a before shot, because I started taking the paper down PB (pre-blog). There are a lot of methods out there to remove wallpaper, and we’ve tried most of them. The top layer of paper scraped off easily, and I just used hot water on the last layers that didn’t want to come up. Since this is antique paper (not vinyl), the water brings it up pretty easily. (That’s easy on a wallpaper removal scale, which ranges from repetitive annoyance to utter misery). 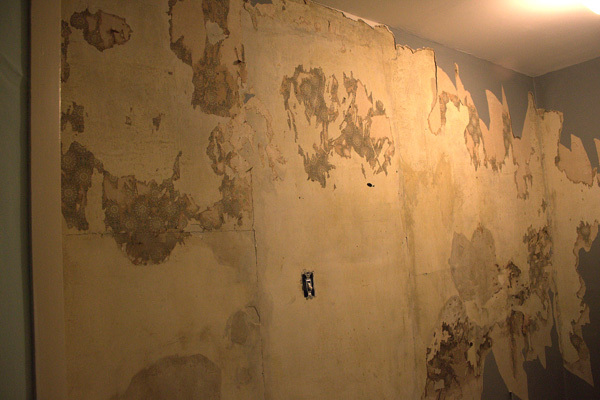 Here it is, ready to begin patching the plaster. Most of the paper on the right wall was adhered firmly, so I’ll be leveling it out with drywall compound, rather than removing it all. Expediency rules! In this shot, you can see the back stairway, and the doorway to the guest room. The first thing that I needed to do is to patch a large area where the plaster has pulled away from the lath. I’m planning to use this niche to display artwork, so I need flat, sturdy walls. Here is the patch in place. 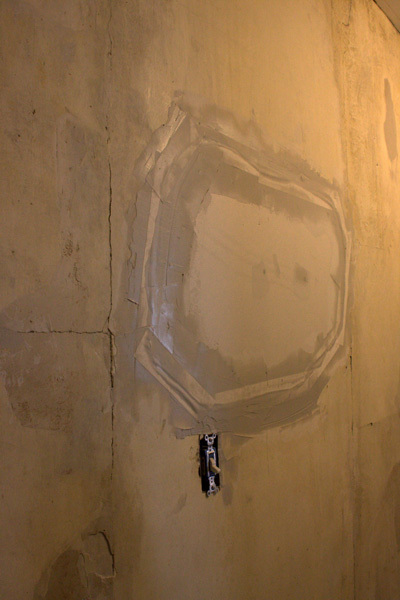 The “proper” way to make this repair would be to cut a square out of the plaster and insert a square patch. I even have a Dremel Multimax that will cut plaster. One small cut in plaster, though, will ruin a $14 blade. 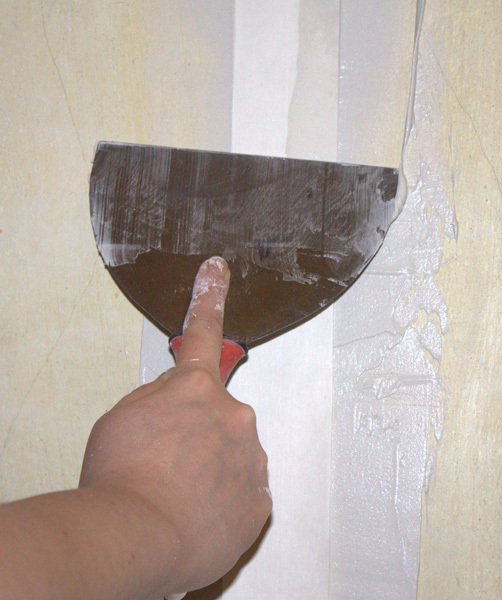 Since plaster is hard to cut and drywall is very easy to cut, I’m taking this route! I pulled out the loose plaster with a hammer, and left the lath in place. I made a template by tracing the shape onto brown paper. I used 1/4″ drywall, which matches the plaster pretty well. And here is the patch again. To fill in the gaps, I used setting compound or “hot mud.” It’s more like real plaster, in that you mix it yourself, and you have limited time to work with it before it sets. It’s good for filling in large gaps, because it doesn’t shrink like drywall compound. Also, it cures much faster, so you can keep working. I usually use 45 minute compound, but you can also get 20 and 90 minute. I also used paper tape over the seams. 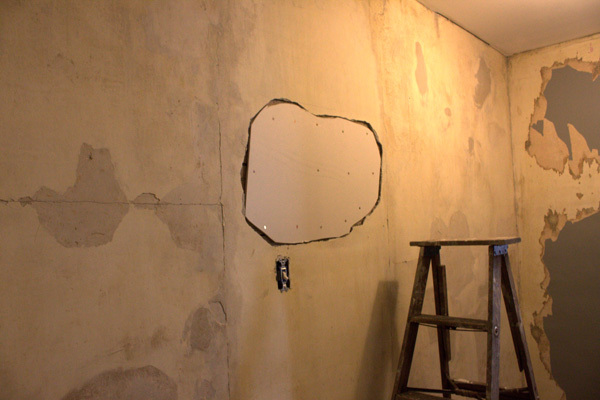 Once that was done, I was ready to start using drywall compound for other cracks and to smooth out some old and uneven plaster repairs. 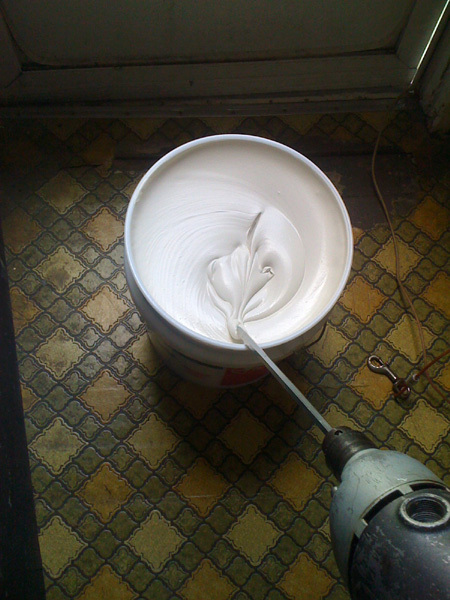 Purists use plaster to repair old plaster, but I’m happy enough with the drywall compound, and it saves many steps. Expediency again! And here it is with the cracks taped and rough spots leveled. I still need to tape the ceiling seams. A previous owner hung drywall on the ceiling in the not-so-distant past. Unfortunately, their finishing job was pretty bad. 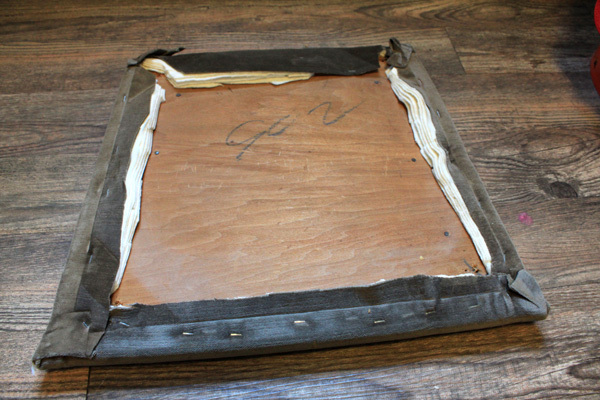 They embedded the tape, and never used any topping coats, so the seams look terrible. The tape was also on top of all the layers of wallpaper, so I just pulled it off. I’ll end up redoing all of the seams eventually. Tomorrow, I’ll do that seam and put the first topping coat on! So, why fix this plaster instead of just demolishing it and putting in drywall? Well, I happen to love old plaster. New drywall just doesn’t compare with the substance of original plaster. 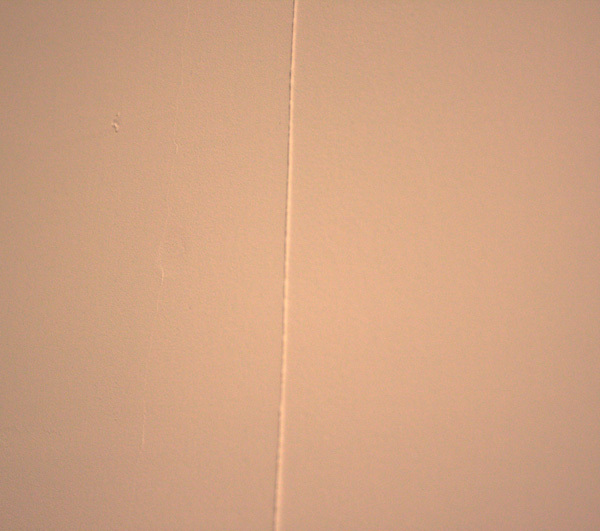 This wall was in good shape, with two main vertical cracks. Overall, the amount of finishing I’ll do is not much more than I would if I put in new drywall. Plus, not having to haul all the old plaster out and carry in new drywall is a relief to my back. I’ll be back tomorrow with an update on this project! If you’re interested in learning more, I used the site www.plaster-wall-ceiling-solutions.com to learn all about repairing plaster. His tutorial was very helpful! Loryn: A really big bulletin board is a great tool for all crafters. Martha Stewart recommends using homosote board wrapped in fabric. It’s reasonably priced and comes in 4×8′ sheets, but I can’t get it without a truck and a 60 mile round trip. Luckily, there is a cheap and easy alternative. I made this bulletin board using suspended ceiling tiles. They make a great bulletin board surface, can be easily wrapped in fabric, and they cost around $5 for a 2×4′ tile. If you know someone who is remodeling, you may even be able to scavenge them. 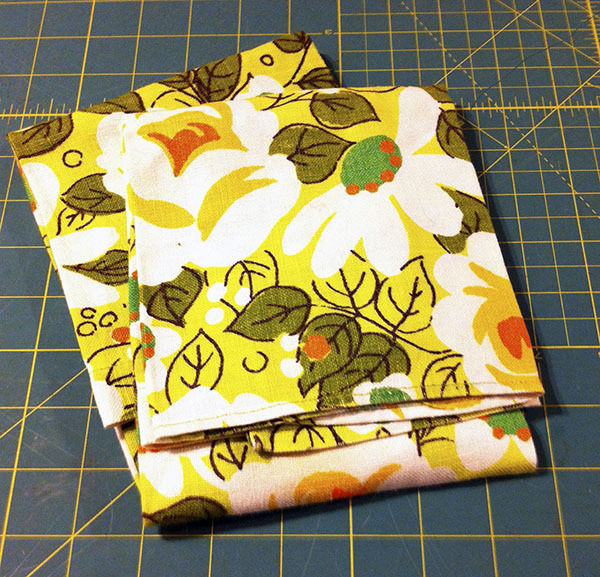 I used fabric from my stash to wrap these, and I cut each tile in half to make better use of the fabric. The tiles are so lightweight that I hung them with a finishing nail in each corner. 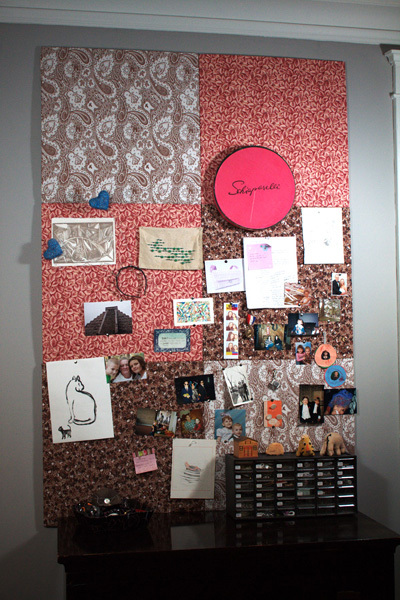 They make a 4×6′ bulletin board from around $15. They’re great to hang over a desk, in a crafting area, or in an entry way for a busy family! I started sewing when I was about five years old. I made project after project after project, drafting my own patterns and getting wildly creative. The one thing that I didn’t have any patience for was the finishing details. My work was sloppily finished until I saw the projects a friend of mine produced. She wasn’t an experienced sewer, but her simple projects were so beautifully finished that they looked great! It finally sank in that all the creativity in the world didn’t pay off if I didn’t pay attention to the details. 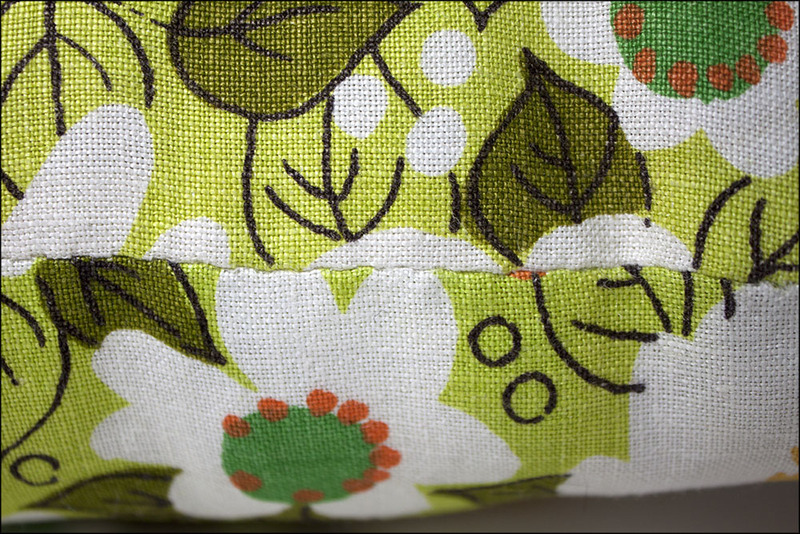 If you haven’t been quite happy with the results of your sewing, read on for tips you can apply to any project. 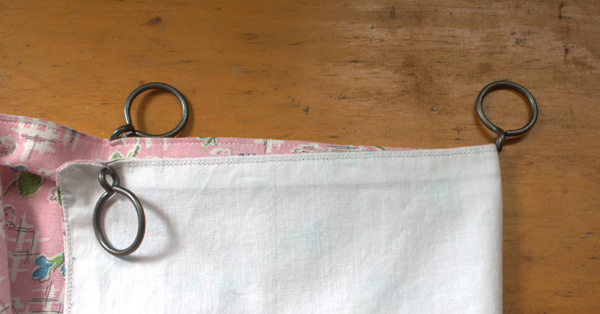 If you only apply one tip to your sewing, it should be pressing. 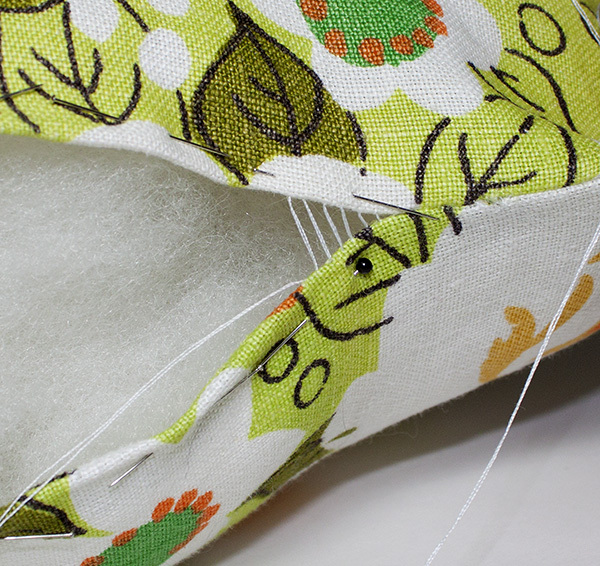 Pressing every seam open may seem like a lot of fuss, but the results are worth it. I set up one end of my work table as an ironing board so I don’t have any excuse to skip it. Because I’m cheap, I just throw a folded towel down and iron on it, as it gives me a lot more surface area than an ironing board. 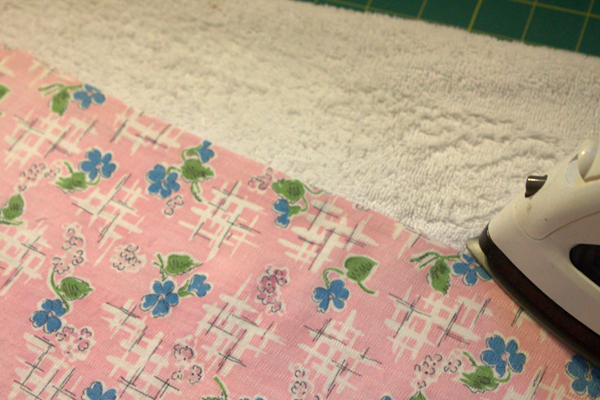 To make the lining, I sew the lining and and the main fabric (right sides together) around three sides like a pillowcase. 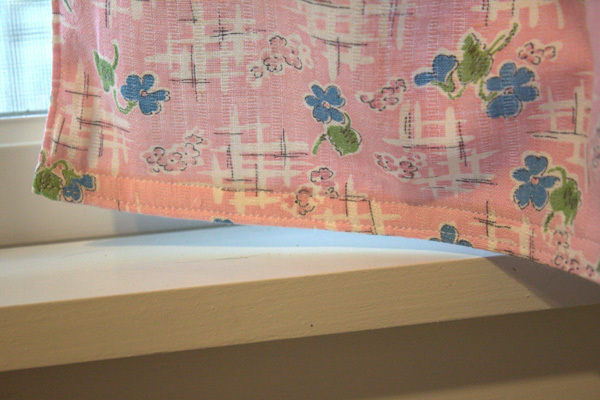 Press the stitched seam, then turn the curtain right side out. 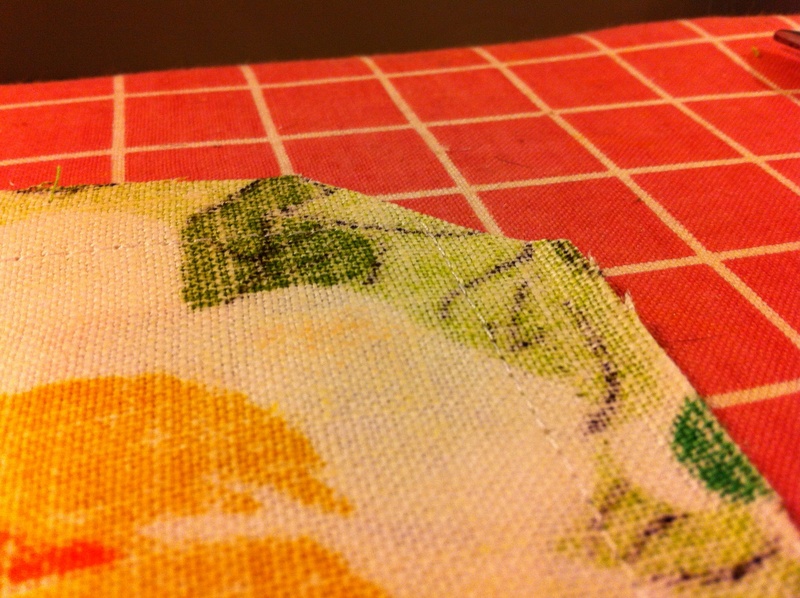 Use a pin to get your corners pointy, then press the edges again in preparation for edgestitching. The edgestitching makes precise edges that look great. I use the 1/8″ mark on my machine’s throat plate to keep the stitching line precise. If your edgestitching is not as straight as you’d like, keep your attention on the 1/8″ mark and keep practicing! Edgestitching around the three seams, and then you’re ready for the hem. 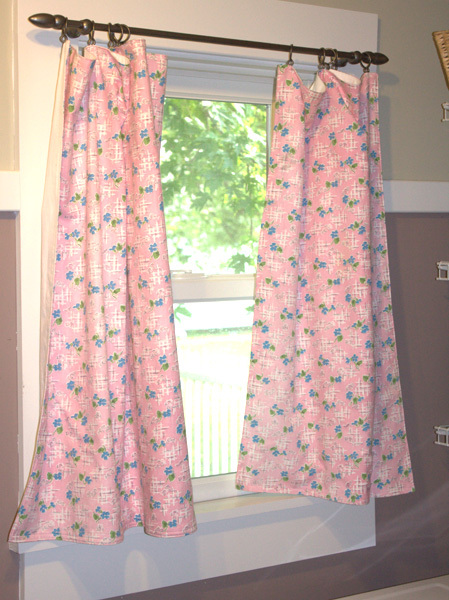 To get the best results, hang your curtains on the rings, and then fold a standard hem. I sewed two lines of stitching. This makes a firm hem that makes a flippy curve along the bottom. Here you can see how I’ve tacked the rings to the curtain. 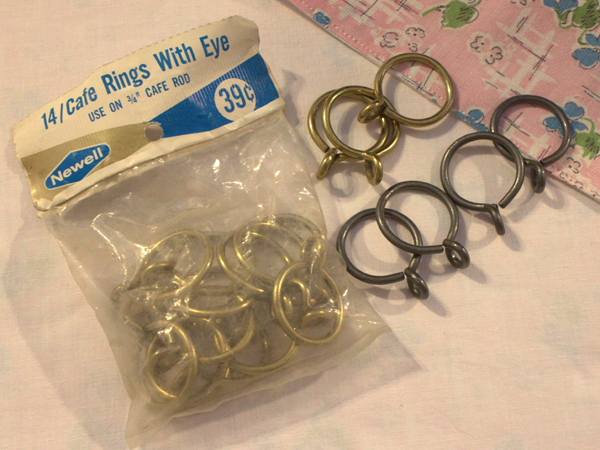 Clips would also look nice, but I have a large supply of vintage cafe rings. Here’s a simple way to get your rings or clips evenly spaced. First, always use an odd number of rings. 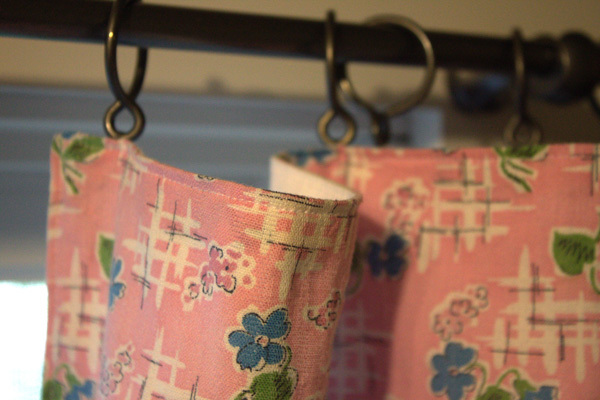 Sew or place the rings at the ends, then fold the curtain in half, lining up the rings you just placed. Place the middle ring at the fold mark. Then quarter the curtain by lining up the end ring with the middle ring. The fold is the spot for your next rings. Do that on each side. 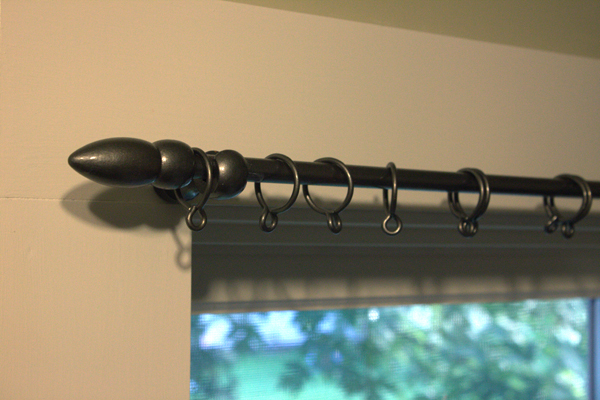 For small curtains, I use five rings for each panel. After one final pressing, the curtains are ready to hang. I hope you’ve found a few tips that will be helpful. 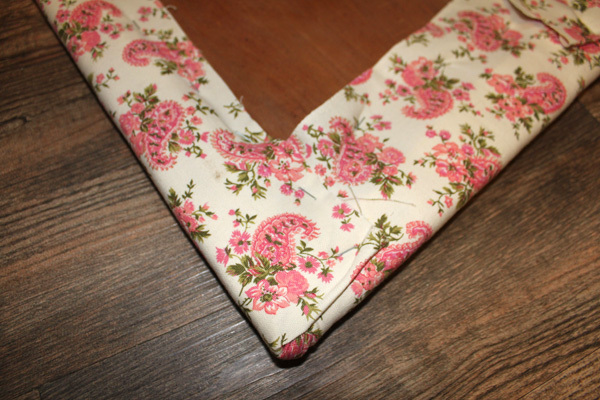 Check back soon for another post on how to upgrade your sewing! 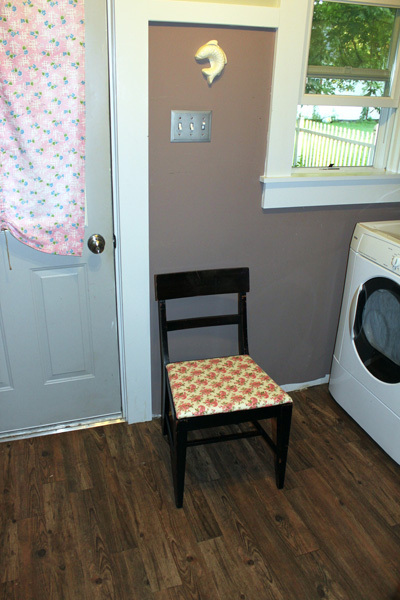 I wanted a chair to put next to the back door in my mud room/laundry room/entry way if I needed to set something down or take off my shoes. This chair was my great-grandmother’s, a vanity chair that is part of a bedroom set. It has been up in the guest bedroom doing duty as a bedside table, and it’s just the chair I’ve been wanting for the mud room. 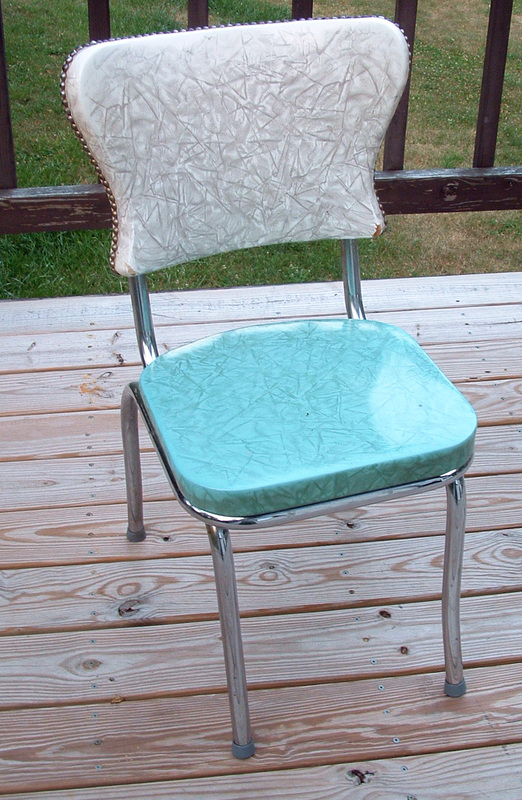 I put that brown upholstery fabric on five or six years ago, and it’s worn and too drab. I just wanted to do a quick and dirty upholstery job. First things first, I removed the screws to take the chair seat off. This chair seat is a good example of why perfectionism isn’t always necessary. My previous upholstery job wasn’t that great. Two of the four screws holding the seat on were missing, and many of the staples holding the fabric on had loosened. It still looked fine and held together. Imperfection works! 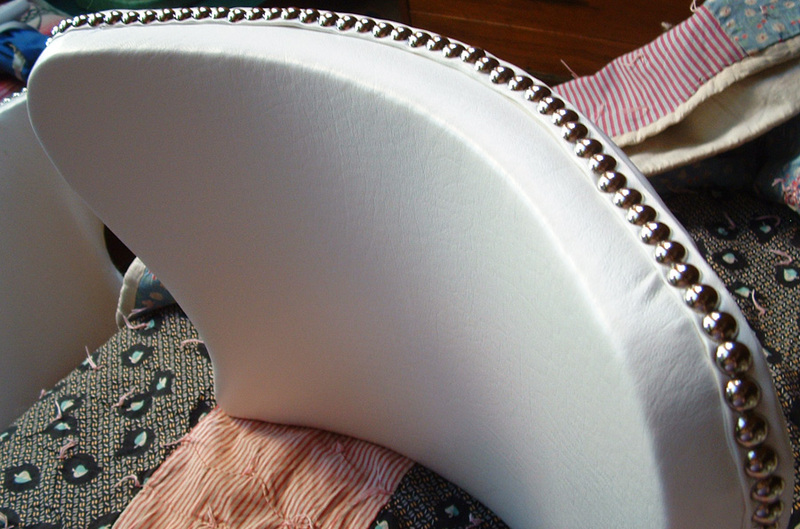 Normally, you would use poly batting for upholstery, but when I did the first job I just used what I had around, which was Warm and Natural quilt batting. I put a layer of muslin over it to protect the batting, and it made this job really easy. Here you can see most of the stapling of the new fabric. The print is random, so I lined the grain of the canvas up with the front edge of the seat. The fabric is a vintage paisley canvas from an auction years ago. Turning the corner properly is the hardest part, but it doesn’t have to be perfect. 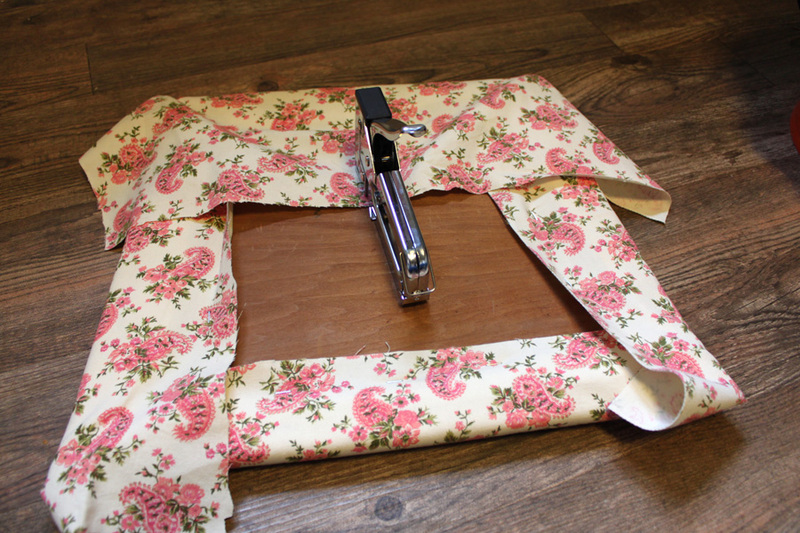 Cut away any excess to make it easier to fold. To make reattaching the seat easier, put the chair upside down on a table. And here is the chair in the room. I still have a few things to do, including finishing the baseboards, so watch for upcoming posts on this room. 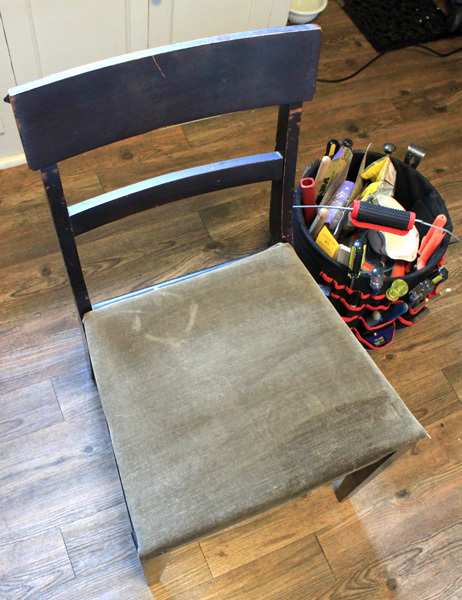 For a really detailed explanation of chair seat upholstery, see this excellent guide from one of my favorite blogs, Design Sponge. The tool list given may seem a bit intimidating, but don’t let that stop you. I only needed a flat and a phillips screwdriver, staple gun, scissors, and water bottle (to keep a cat off my project!). We picked this commercial display case up at a garage sale years ago for the outrageous price of $5. 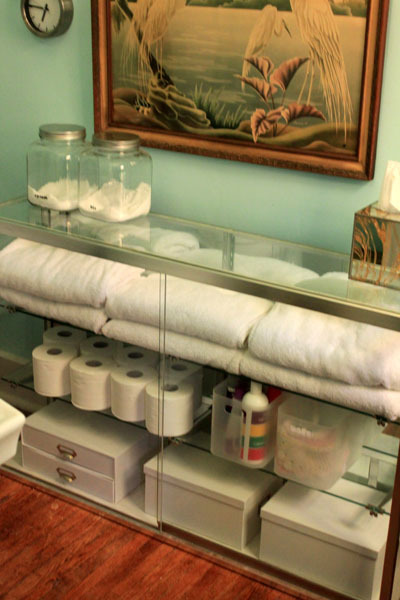 It hadn’t found a home in the new house until I thought of it when I needed cat-hair-free storage in my new bathroom. One surprise benefit of using it is that it takes up almost no visual space. Even though it holds a lot, it doesn’t look like an enormous piece of furniture. I will admit that to look good, it needs to be neatly organized. 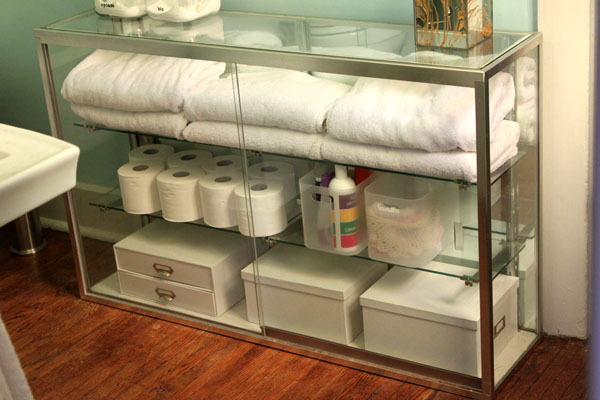 I like the look of all white storage. The tall plastic containers are from MUJI.com. I love their storage, and they ship!